My husband is a volunteer for the Israeli police. He, like thousands of others in Israel donate their time and dedication and in return, they get the gratitude not only of our friends and neighbors, the community and city, but also of “fellow” police officers. Each year, we are invited to a gathering, some gifts, a nice dinner. Once there was music and dancing, once there was a comedian. This time, there was a catered dinner, flowers for the wives and girl friends (and I guess for the female police officers or their spouses), and a movie in Jerusalem’s Cinema City. For the last few years, my company has been organizing a conference of hi-tech professionals (www.megacomm.org) at Cinema City so when I arrived, I was greeted by the Events Manager and we spoke for a few minutes. She told me the name of the movie we would be seeing. In Hebrew, it is “Heroes of Boston” and I already had an idea of what awaited us. 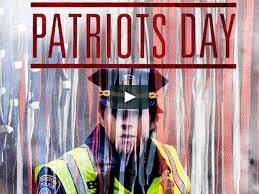 In English, the name of the movie is Patriots Day and it tells the “story” of that fateful day; the runners whose lives were devastated, the police who worked around the clock to find the bombers before they struck again. It was fascinating watching the movie in an audience that probably was never considered when the actors took their places. Watching a terror attack unfold, the panic of those first few minutes, is, for an Israeli, a special kind of nightmare. Even when you know it is “only” a movie…this time. Even when you know they will catch the terrorists. Especially when you know, as you watch the loving couple interact, that they will both be severely injured. But watching that terrorist attack, watching the emergency forces swing into action – too slowly for these Israeli eyes, too disorganized, so much in shock because they don’t expect, they haven’t really experienced what we have here – was somehow different, more intense in a room filled with the kind of people who would be there on the scene – if the scene was here and not up on the screen. It was a personal blow to everyone in the room. And as the police swung into action, there was such tension in the room. And there was a feeling, at least inside of me (and the wife of a police officer sitting next to me), as to why we had to sit in this room and watch what we all dread happening every day of our lives here. There was almost a battle between reviewing how the American police handled the situation and the need to remember this was, after all, only Hollywood. Why are the ambulances taking so long? Why are the police walking around as if they don’t have a clue what to do? What nonsense to leave a child’s body lying on the ground for hours. Damn the evidence, help the victims. Move, move, hurry. Why are you moving so slowly, why are you so shocked? Move! Yes, we know what happens when an explosive rips through a human body, why…why are you focusing on the mangled legs, the blood, the gore? Why do we have to sit here on a night that was supposed to be relaxing and fun, and watch this? In walks the FBI and there is a quick discussion over jurisdiction. No, that doesn’t happen here – at least I don’t think it does. The Boston police are quick to point out that since it is terrorism, clearly it falls to the FBI to investigate. The FBI agent cautions them about speaking too quickly lest they unleash a wave of anti-Muslim sentiment and says they don’t yet know that it IS terrorism. And no, that doesn’t happen here. The opposite, We are quick to assume terrorism. Eighty fires a few weeks ago; many immediately announced they were arson attacks, terrorism – and we were right. seventy-one of the eighty have already, conclusively, been proven to have been set intentionally in our forests and cities. And we watch as these US security forces debate whether two bombs blowing up simultaneously in crowds of thousands of people is terrorism. What else could it have been? Every police officer in the movie theater did the Israeli equivalent of snorting. You could almost hear people thinking, “Seriously?” We had the urge to reach into the screen and shake them! Yes. Say the damn word! Apparently unable to hear the thoughts of a room full of Israelis, the FBI agent slowly kneels down and picks up some shrapnel that had clearly been part of the bomb the camera zooms in. This is the cruelty of terrorism; stuffing shrapnel into the bomb to cause additional harm as the shrapnel is propelled like bullets by the force of the explosion. After a good Hollywood pause, the FBI agent brilliantly announces, “It’s terrorism.” Well, great. Yalla, you put the pieces together, was in the minds of most of us. The Hollywood version included massive shootouts, exploding cars. It was a mixture of funny lines (after shooting up the boat where the second terrorist was hiding, one policeman comments, “well that boat won’t float”) and wonderful examples of the love and support between the families of victims, the wives of the police officers, and the city in general. It was a story that was told carefully, with sensitivity to the victims so that it became clear that more than victims, they were people and they were survivors or a horrible and violent attack. And there were some glaring omissions that hit most of us in that movie theater like a slap in the face and lessened the very message of the movie. There is the speech that the star police officer (Mark Wahlberg) gives – the one in which he tries to ensure everyone that there is still hope, and love, and that these will triumph because all over the world, people are fighting back. “What I saw today – good versus evil, love versus hate” says the hero cop around which the story revolves. Love is going to win, he assures his audience. That part was great and the audience here in Israel was with him, until his speech about how we all have to accept that this is happening all over the world. I don’t remember the names of the places he listed to show that terrorism is universal, Islamic fundamentalist terror, that is. London, perhaps. Certainly Paris. Of course, he mentioned other cities in the US. What I will tell you was that there was a blaring omission that upset a lot of people in the room. Of all the places that were listed, not one was in Israel. Europe, the US…nothing about Jerusalem, Tel Aviv, or any attacks here. I think, in some way, that omission invalidated the movie for many of us. You can’t claim to understand the universality of terror and terror victims when you exclude Israel. The movie correctly showed how authorities are sometimes so careful not to offend, they lost valuable time and evidence because they were too scared to release a picture that might make people think they were looking for a Muslim. The police were quick to deny that a Saudi national was a suspect and held on to the picture of the two they did suspect until they were forced, according to this movie, because the picture was leaked to Fox News. The police in Boston did not come across as particularly competent. The FBI certainly was not impressive. But there was a message that the movie makers wanted to deliver. It was to have been a message of hope and love, the idea that western society could beat terrorism, though you’re never quite sure how that will happen. And most of all, it was to have been a message from our world to terrorists. We are united by a shared commitment to live, to life. Yes, the story of the Boston marathon was an important one to share because despite initial opposition by the FBI (if the movie narrative is to be believed), Boston fought back. The victory over terrorism was found in the outpouring of support from around the globe. But until that outpouring of support reaches Israeli shores, includes the victims here in the attacks here, the world will not truly defeat terrorism. And as an aside note, putting the Israeli flag on Berlin’s Brandenburg Gate and Rotterdam City Hall and the Paris Municipality is a very nice gesture to show solidarity with the four victims of the latest attack in Jerusalem recently, but it was clearly connected to the fact that a few days later, these very nations had every intention of joining together in Paris for a one-sided, pre-determined, anti-Israel conference. No one in Israel viewed those gestures as much more than a political gesture than any real message of support. The movie ended, but was ruined for most in the room. You want us to praise you for your bravery; but what of ours? What of the bride who invites all of Israel to her quickly rescheduled wedding to celebrate, even though her heart is broken because her father was murdered just days before he was to have walked her down the aisle? What of the father who risked his life to try to save others? What of the bus driver who shoved the terrorist out the door, slammed the doors closed and drove to get his passengers away? You want us to honor your victims? Are they any more precious than ours? Does Daphne Meir, who fought a terrorist to save her children not deserved to be remembered? Does Hallel Yaffa Ariel not deserve to be mourned? She was 13 years old when a terrorist climbed into her room and stabbed her to death. Is she any less a victim than those who were in Boston on the day of the marathon? You want us to pray for your survivors…will you not pray for ours? And you want us to remember that terrorism will be defeated by love, by unity? How is that possible when you ignore the love we have offered, the unity we expected and deserve. So long as Jerusalem and Tel Aviv, Kiryat Arba and Itamar, Afula, Haifa, Beersheva and Raanana are not part of your message, terrorism will have triumphed, not you…and not us. As we left the movie theater, one man told me that he was 8 years old when his parents came to him and told him his brother had been on a bus targeted in a terror attack. I would believe it almost impossible that every person in that room had not been touched, didn’t know someone who was hurt or murdered in a terror attack. Patriots Day is an important movie because it shares with its audience an important message – terrorism must be fought. In the days following the marathon bombing attacks, Boston learned many lessons. But what came shining through here in Israel the other night, was that perhaps the lessons learned didn’t really go far enough to accomplish the great and holy mission of defeating those who want to not only kill our civilians, but our civilization, our culture, our world. Who “rewards” people with a movie that leaves them feeling less? I get your message loud and clear and as usual it is extremely well written, but there are a lot of better movies they could have chosen. The new Star Wars movie comes to mind. Or maybe an Isreali movie? I think I was incredibly insensitive given the subject matter to stress the people out they were trying to reward. I wonder if the genius who set this event up saw the movie and figured out that it would have a negative impact given that many/all of them have experienced in some form this brutality first hand. I did not see the movie, nor do I intend to because reliving the Boston Marathon bombings is NOT my. Idea of entertainment, no matter how they portray it. Plus I don’t think Mr. Wahlberg can act worth a lick. I am sorry that the world is insensitive to the plight of the Isreali people. We do not know what it is like to live in your shoes, nor do we really want to, truth be told. Maybe by ignoring it, we think we are somehow illogical safe from it…that is of course until it comes knocking at our doorstep. God bless Israel and the Israeli people. Thank you for your comments. I agree – not the best of choices. I spoke to the organizers from the police side – it wasn’t their choice. From the venue side (the ones who chose it), they were trying to find a very new movie so that they wouldn’t force a “captive” audience to watch a movie that someone might have seen. So, they picked the newest movie they had – with relatively good ratings. Action because there were a lot of men, etc. and obviously didn’t think enough about what it would feel like to see a terror attack unfold slowly over 2 hours. It was not a movie I would have chosen to see. I have to admit that it was well done, though personally, I didn’t need the graphic blood scenes and I wouldn’t be surprised to find that it raised people’s blood pressure. When I left, I asked the police rep to “next time make it a funny movie” because it really was a wonderful evening out…other than the subject matter and yeah, wish it had been a different movie! Thank you for your blessings and may God bless America and the American people.